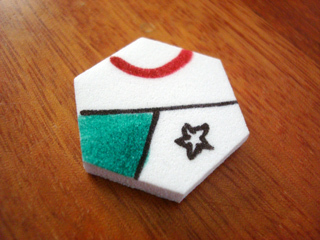 Pack of 75 foam hexes of the same colour. 3 cm diameter (1,5 cm side) and 5 mm thick. Perfect for prototyping (these are what I use). You can write on them with crayons, as you can see in the picture below. And they're very light, perfect for transportation. Ask me for available colours. Important notice: White foam gets a bit stained due to the laser cutting process. Although this can be easily removed, sometimes a bit of stain still remains. This doesn't happen with the other colours, though.